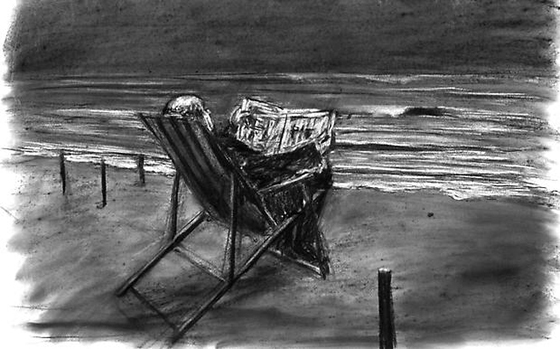 It is a humorously discordant image: a man in a pinstriped suit sits on a deck chair at the beach, ignoring the overcast vista by reading a newspaper. The figure’s balding head and newspaper are the brightest highlights against the smooth, rippling surf. 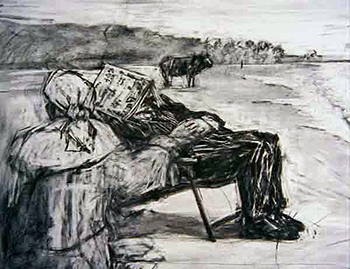 South African artist William Kentridge has said the inspiration for this scene was a photograph of his grandfather similarly dressed at a beach near Capetown. The contrast of formal dress and beach setting—while whimsical—also suggests class distinctions and the disconnect between experiencing one’s environment and codification as control: rather than watch the tide, the figure (as we come to find out) reads the newspaper’s tide table (a chart that shows water heights over time for a particular location). The gulf separating understanding and experience in this drawing resonates in much of Kentridge’s imagery and process. Kentridge was raised by two progressive lawyers in Johannesburg who actively helped disenfranchised South Africans navigate the legal system during the systemic inequalities of apartheid. 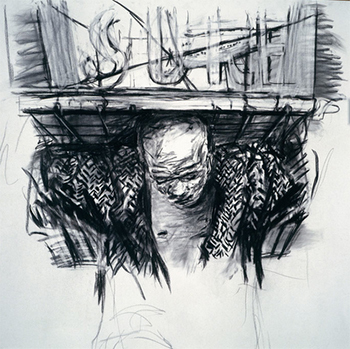 The harsh racial and socioeconomic conditions in South Africa marked the earliest work Kentridge produced after studying visual art at the Johannesburg Art Foundation and theater at the L’École Internationale de Théâtre Jacques Lecoq in Paris. Kentridge’s earliest passions were theater and opera (and he has continued working in these areas throughout his career), yet after realizing he was not cut out as an actor, he was “reduced to being an artist.” As he has described it, “Every clear decision I have made was wrong. And the only thing that saved me was what I hadn’t decided.” This deceptively self-deprecating remark adequately describes the intentional openness and mutability of meaning Kentridge has built into his approach. The drawing above is the result of a film, Tide Table, the ninth film in the series “Drawings For Projection” begun in 1989. These films utilize a unique stop-motion technique: using a 16mm camera, Kentridge photographs each stage of a drawing on one sheet of paper as he continually modifies it through additions and erasures, often leaving ghostly remnants of previous marks on the page. He even periodically appears within the frame, such as by placing a new sheet in front of the camera when the previous drawing/scene is finished. The resulting work of art is generally comprised of two elements: an animated film and a series of drawings. 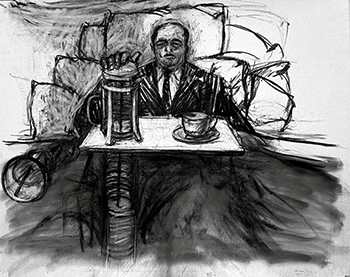 Unlike traditional animation, which is painstakingly planned and comprised of thousands of single images each denoting a fraction of a second, Kentridge’s films develop organically without any preparatory planning like storyboards, relying more on a stream-of-consciousness approach that strives for something between random chance and conscious premeditation. Kentridge associates this with the concept of “fortuna,” in which his imagery and narrative are influenced by objects in his environment or ideas and motions that seem intrinsically related to—but independent of—the themes and narrative being tackled at the time. The relationship might be comparable to that of authors noting how their characters do something unexpected in the course of writing a novel. There is a performative quality to Kentridge’s process, predicated by the spontaneity he fosters, his own appearances in the frame, and the film itself as a time-based record of his drawing process. Kentridge’s drawings for his films are often regarded as palimpsests. A palimpset is the word for a manuscript where the original text has been erased and overwritten (a practice common before paper was available and when parchment was expensive). In Kentridge’s work, the sheet of paper becomes the locus for layer upon layer of images that evolve and shift, where the earlier states of the drawing exist only through traces intentionally left on the paper. In the film, these traces help intensify the movement of his figures, but also visually remark upon the process as a physical interaction of charcoal and eraser on paper. The palimpsest quality to Kentridge’s approach is one that many critics and historians have associated with his reaction to growing up during a turbulent and shifting period in South African history. Apartheid, legalized racial discrimination, dominated South African governance and society from 1948 until 1994. One way Kentridge has made overt reference to the atrocities of apartheid in his “Drawings for Projection” series is through the one pre-determined facet of these narratives: an established “cast” featuring the wealthy white real-estate developer and industrialist Soho Eckstein. Eckstein represents the authoritative oppressors ruling over black South Africans. In the 1990 film Monument, for example, Eckstein unveils a heroic monument showing a black worker struggling to carry a load of pristine marble objects. An ostensibly commemorative sculpture to the efforts of South Africans is revealed later to be an actual living person, not a sculpture. Racial discrimination is starkly reduced to the contrast between the “sculpted” worker’s body and the white classically-styled load he bears. In the 1991 film, Mine, a similar contrast is presented between Eckstein’s white bed coverings and tray as he enjoys coffee, and the grueling, dank conditions of the mines that Eckstein owns. The two are linked visually by the downward action of the French-press coffee maker that becomes the elevator within the mines. Such contrasts seem intentionally provocative, both formally and thematically. Yet Kentridge admits that the decision to have the coffee plunger become the elevator shaft was another example of fortuna, inspired simply from the fact he had that type of coffee maker in his studio that day. A critical event linked to the legal dissolution of apartheid in the 1990s was the establishment of the Truth and Reconciliation Commission. Chaired by Archbishop Desmond Tutu, the Commission was a five year investigation into the crimes and human rights abuses committed under apartheid from 1960 until May 10, 1994. The results of the investigation, broadcast on South African television, were intended to bring to light crimes committed and the breadth of the structure of racism and disenfranchisement. Although Kentridge’s process was established several years before the Commission, scholars like Jessica Dubow and Ruth Rosengarten have linked the palimpsest quality of Kentridge’s “Drawings for Projection” with the contradictory nature of the Commission: although the broadcasts intended to reveal atrocities, they also established that the harrowing acts revealed were firmly “in the past” and therefore not reflective of the dawn of a post-apartheid South Africa. Dubow and Rosengarten suggest that Kentridge’s palimpsest technique is reminiscent of the Commission’s attempts to show—but also remove—traces of apartheid and that Kentridge’s “finished” drawings similarly do not fully reveal everything that went into making them. The documentation of every stage of the drawing is only seen in the animated film, hence the reason the drawings and the films are intrinsically related and should not be separated. The disconnect between documentation and direct experience seen in the hearings of the Truth and Reconciliation Commission is also central to the drawing of Soho Eckstein sitting at the beach in a business suit. In the films he created after 1994, Kentridge presents Soho as a man whose life has fallen apart: between inexplicable health issues, violent nightmares, and the loss of his fortune, Kentridge portrays Eckstein’s struggles in post-apartheid South Africa. Throughout Tide Table the artist provides a subtext that reflects upon youth, as a choir on the beach sings and a young boy dances and leaps in the surf. Often this occurs around Eckstein, as he sits in the deck chair, seeming to prefer the analytical table of tide flows in the newspaper and, in a later scene, pointedly placing the newspaper over his head to sleep (see above). These images reinforce Eckstein’s character as one who is more comfortable at a remove from human connection and the natural world, a portrayal that is common to many of the films in the series. Eckstein’s actions in Tide Table evoke a sense of loss for the comforts and advantages the character had during apartheid. Still, there is a glimmer of hope. Ultimately Eckstein observes those around him; he gets up, and playfully throws a rock into the water. Cite this page as: Josh R. Rose, "William Kentridge, drawing from Tide Table (Soho in Deck Chair)," in Smarthistory, September 7, 2018, accessed April 22, 2019, https://smarthistory.org/william-kentridge-drawing-from-tide-table-soho-in-deck-chair-2/.